There are a couple of issues with this formula. Firstly, it's not that easy to work out what is going on given the number of cell references involved. 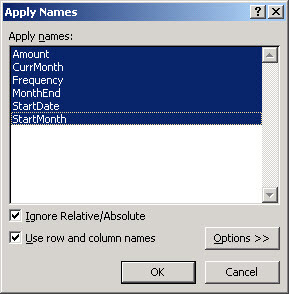 Secondly, in order to be able to copy it to other rows and columns, you have to be very careful with the use of the dollar signs to make the right elements of each cell reference absolute or relative. Hopefully, the use of names rather than references makes it a little easier to understand how our formula works. MOD() returns the remainder after dividing its first argument by its second - so for months that are multiples of our desired frequency, MOD() will return zero. We also need to check that the start date is before the relevant month end.